“In early September 2018, we lost one of our closest friends and our biggest fan, our manager Nick John. He was essentially the band’s Dad. From our highest highs to our lowest lows he was always there. Every single move we made went through him first as our trust in him was marrow deep. His favorite band besides us and Gojira, was Led Zeppelin. We were asked to perform ‘Stairway to Heaven‘ at his funeral. Afterward, finding out that someone had recorded it, we figured we should record a studio version and release it on Record Store Day as a tribute to Nick with all the proceeds to be donated to pancreatic cancer research. We would not be the band we are today without the help of Nick John. We miss him dearly and think of him always. We love you buddy. The limited edition 10-inch vinyl features the Studio Version on Side A and a Live Version on Side B. It will be available in participating independent retailers on Saturday, April 13, 2019. Mastodon have announced that they will be releasing a cover of Led Zeppelin’s “Stairway To Heaven” as a tribute to their late manager Nick John, who sadly passed away following a battle with pancreatic cancer. The track will be available as part of this year’s Record Store Day (April 13) and proceeds will go towards the Hirshberg Foundation for Pancreatic Cancer Research. 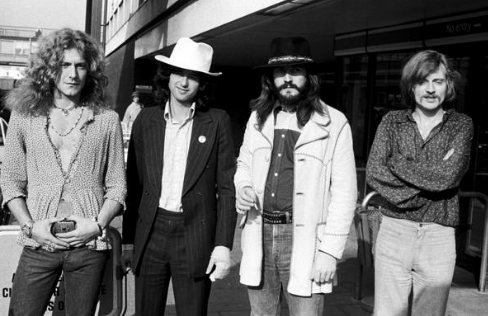 Led Zeppelin Accused Of Plagiarism? According to Rolling Stone, the band Spirit is suing Led Zeppelin due to similarities between “Stairway To Heaven” and Spirit’s song “Taurus.” Attorney Francis Alexander Molofiy, a lawyer representing deceased Spirit guitarist Randy California, claims the “Stairway To Heaven” intro was a rip off of “Taurus,” which was released three years earlier. He is also trying to prevent the reissue of Led Zeppelin IV, to “make sure that Randy California is given a writing credit on “Stairway to Heaven,” because “it’s been a long time coming.” Spirit and California’s family claim the reason they waited so long to press charges is due to insufficient funds to hire lawyers. As for the lawsuit, we will have to wait to see how it plays out.